Airapport is mobile game development studio, which started gaining popularity since the release of Steampunk Idle Spinner in 2017. By now more than 1 million of players have downloaded our mobile games. We thank the players, who play our games, beta test them, share fresh ideas and suggestions, help us fix bugs by providing necessary information, and who review our games in the stores. Your support is very valuable! Our mission is to revolutionize mobile idle gaming and to bring many interesting elements into the idle mechanics. The game engine, which we created while making Steampunk Idle Spinner, appeared to be very flexible, and allowed us to implement the most bizarre gameplay experiments, which lead to fun and unusual way of playing. This is a "flagship product" of Airapport idle games. This game is all about mad science and exploration of steampunk worlds. The player starts in a workshop and all what is available at first is the ingenious money-making machine. Later on, as more income is gained, engines, cogwheels, pumps, mines and other gear becomes available. Once the workshop is fully equipped, a portal appears, which lets the player travel to other steampunk worlds: Clockwork City or Floating Islands. Plans: Add more machines every 2 months. Plans: Add one world, several machines, and release. Then add one more world. 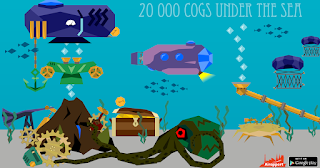 This is the second spin-off of Steampunk Idle Spinner, made in response to the community request, "to make underwater worlds like in the Jules Verne's adventures of captain Nemo". This game starts on the underwater base, and you must extract oxygen from the underwater volcano. As you expand, mechanical crabs and fish, octopuses and whales start helping you gain more oxygen and reach the water surface. You even have a chance to discover Atlantis Crystals, which will boost your engines. Easter game about managing chicken farm and painting Easter eggs. Hen produce eggs, which roll down to the storage. 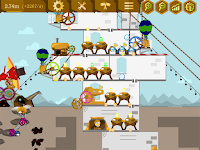 The player controls the painting machines, which apply various patterns on the eggs. The colored eggs are priced higher than the regular eggs. Player can spend earnings to unlock new hen in fancy outfit. Plans: Add 2 more farms: Sheep farm and Cow farm after Easter. Facebook group - the biggest community of players, counts 7000+ members from all over the world.